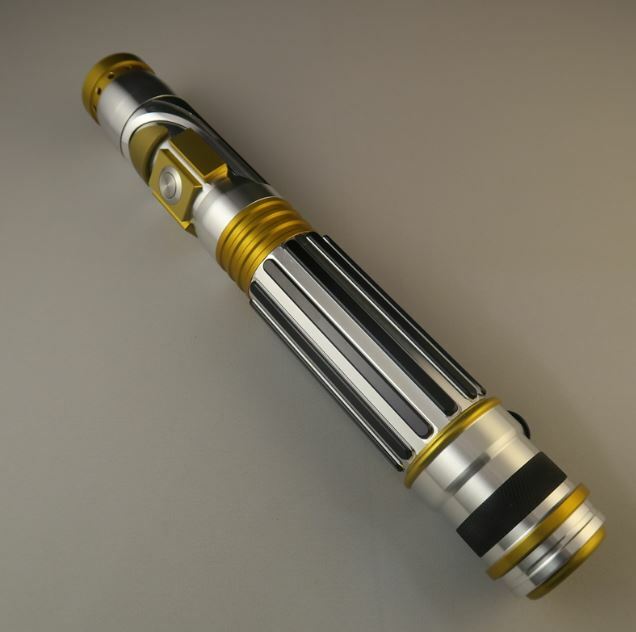 Yesterday, Ultrasabers sent out an email announcing their new Electrum Wind saber hilt. The hilt, which draws substantial inspiration from the one used by Mace Windu in the prequels, is the latest in Ultrasabers’ line of film-inspired designs. It is also very likely the company’s most intricate hilt to date. The gold, black, and silver accents all combine to make for a very attractive hilt that still has Modular Hilt System (MHS) compatible pommel and emitter. These features come at a pretty reasonable price. Empty, the Electrum Wind will set collectors back $139. In related news, Ultrasabers is expected to have a facsimile of Ahsoka Tano’s Clone Wars hilt available sometime before the end of the year. Ahsoka’s main saber is one of my favorite canon designs and I am excited to see a few companies are working on replicas. Keep an eye out for this one.